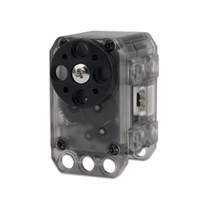 ※ XL-320 is a different product from the OLLO Geared and Servo Motor. Please be cautious not to have the same IDs for the connected dynamixels. You may face communication issues or may not be able to search when IDs overlap. It represents the communication speed. The angle limit allows the motion to be restrained. The range and the unit of the value is the same as Goal Position(Address 30, 31). The wheel mode can be used to wheel-type operation robots since motors of the robots spin infinitely. The joint mode can be used to multi-joints robot since the robots can be controlled with specific angles. Caution : Do not set the temperature lower/higher than the default value. When the temperature alarm shutdown occurs, wait 20 minutes to cool the temperature before re-use. Using the product when the temperature is high may and can cause damage. It is the operation range of voltage. 50 to 250 (0x32 ~ 0x96) can be used. The unit is 0.1V. For example, if the value is 80, it is 8V. If Present Voltage (Address42) is out of the range, Voltage Range Error Bit (Bit0) of Status Packet is returned as ‘1’ and Alarm is triggered as set in the addresses 17 and 18. It is the torque value of maximum output. 0 to 1023 (0x3FF) can be used, and the unit is about 0.1%. For example, Data 1023 (0x3FF) means that Dynamixel will use 100% of the maximum torque it can produce while Data 512 (0x200) means that Dynamixel will use 50% of the maximum torque. When the power is turned on, Torque Limit (Addresses 34 and 35) uses the value as the initial value. Dynamixel can protect itself by detecting errors occur during the operation. The errors can be set are as the table below. It is possible to make duplicate set since the function of each bit is run by the logic of ‘OR’. That is, if 0X05 (binary 00000101) is set, both Input Voltage Error and Overheating Error can be detected. If errors occur, in case of Alarm LED, the LED blinks; in case of Alarm Shutdown, the motor output becomes 0 % by making the value of Torque Limit(Address 34, 35) as 0. Keeps Torque from generating by interrupting the power of motor. Generates Torque by impressing the power to the motor. XL series will use the PID controller as a main control method. P gain refers to the value of proportional band. ※ Explanation for PID required. FYI, PID control theory is not only limited to the control of motor(actuator) but is a generic theory that can be applied to all kinds of control. It is a position value of destination. 0 to 1023 (0x3FF) is available. The unit is 0.29 degree. If Goal Position is out of the range, Angle Limit Error Bit (Bit1) of Status Packet is returned as ‘1’ and Alarm is triggered as set in Alarm LED/Shutdown. If it is set to Wheel Mode, this value is not used. It is a moving speed to Goal Position. The range and the unit of the value may vary depending on the operation mode. 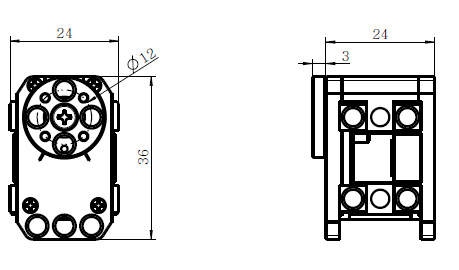 0~1023 (0X3FF) can be used, and the unit is about 0.111rpm. If it is set to 0, it means the maximum rpm of the motor is used without controlling the speed. If it is 1023, it is about 114rpm. For example, if it is set to 300, it is about 33.3 rpm. Notes: Please check the maximum rpm of relevant model in Joint Mode. Even if the motor is set to more than maximum rpm, it cannot generate the torque more than the maximum rpm. 0~2047( 0X7FF) can be used, the unit is about 0.1%. If a value in the range of 0~1023 is used, it is stopped by setting to 0 while rotating to CCW direction. If a value in the range of 1024~2047 is used, it is stopped by setting to 1024 while rotating to CW direction. That is, the 10th bit becomes the direction bit to control the direction. In Wheel Mode, only the output control is possible, not speed. For example, if it is set to 512, it means the output is controlled by 50% of the maximum output. It is the value of the maximum torque limit. 0 to 1023 (0x3FF) is available, and the unit is about 0.1%. For example, if the value is 512, it is about 50%; that means only 50% of the maximum torque will be used. If the power is turned on, the value of Max Torque is used as the initial value. Notes: If the function of Alarm Shutdown is triggered, the motor loses its torque because the value becomes 0. Once error conditions are resolved and this value is changed to the value other than 0, the motor can be operated again. It is the current position value of Dynamixel. The range of the value is 0~1023 (0x3FF), and the unit is 0.29 degree. Caution: If it is set to Wheel Mode, the value cannot be used to measure the moving distance and the rotation frequency. It is the current moving speed. 0~2047 (0X7FF) can be used. 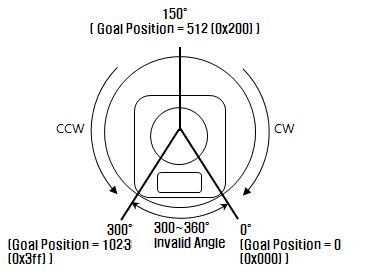 If a value is in the rage of 0~1023, it means that the motor rotates to the CCW direction. If a value is in the rage of 1024~2047, it means that the motor rotates to the CW direction. That is, the 10th bit becomes the direction bit to control the direction, and 0 and 1024 are equal. The unit of this value varies depending on operation mode. The unit is about 0.111rpm. For example, if it is set to 300, it means that the motor is moving to the CCW direction at a rate of about 33.3rpm. The unit is about 0.1%. For example, if it is set to 512, it means that the torque is controlled by 50% of the maximum torque to the CCW direction. It means currently applied load. The range of the value is 0~2047, and the unit is about 0.1%. If the value is 0~1023, it means the load works to the CCW direction. If the value is 1024~2047, it means the load works to the CW direction. That is, the 10th bit becomes the direction bit to control the direction, and 1024 is equal to 0. For example, the value is 512, it means the load is detected in the direction of CCW about 50% of the maximum torque. Notes: Present load is an inferred value based on the internal output value; not a measured value using torque sensor, etc. Therefore, it may be inaccurate for measuring weight or torque. It is recommended to use it for predicting the direction and size of the force being applied to the joint. It is the size of the current voltage supplied. It is the internal temperature of Dynamixel in Celsius. Data value is identical to the actual temperature in Celsius. For example, if the data value is 85 (0x55), the current internal temperature is 85℃. Goal position command execution is completed. Goal position command execution is in progress. Current to drive motor is at minimum. Can choose vales from 0x20 to 0x3FF.